Severely damaged in a fire in 1731, this psalter was part of the collection of Robert Cotton which eventually became part of the British Library. It was made in Ireland, although where is not known for certain. An inscription, now lost, was supposed to have connected it to a person called Muiredach. The most well-known Muiredach was abbot of Monasterboice in the early 10th century, and usually the psalter's origin is placed there for that reason. Also, some of the decoration in it resembles carvings on the stone Cross of Muiredach at Monasterboice. 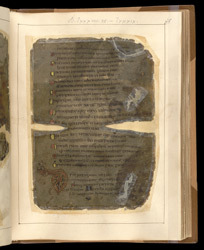 An imaginary animal inhabits each page of the psalter, as on this page with Psalms 88 and 89. The first letter of Psalm 89 is created by a contortionist beast, whose elongated body and rounded forms resemble animal ornament in Anglo-Saxon manuscripts of the late 8th and early 9th century as well as earlier Irish book art such as that in the Book of Kells.